James Mace in action against Bradford Park Avenue. 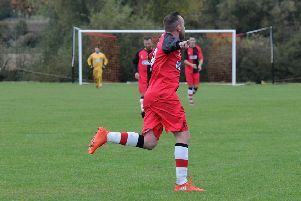 Colby Bishop grabbed the headlines with two goals but it was Junior English, who notched the other, who was among those singled out for praise by the Brakes boss. And he said the elder statesmen in the side were one of the reasons Brakes have succeeded where others have failed. “They don’t make them like Hoody, Mace, Junior and Joe Clarke any more,” he said. “Maybe it’s a generational thing. “It been on my mind to evolve the team for some time and we’ve tried to bring people in but the likes of Hoody and Mace keep bouncing back. 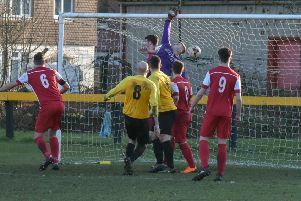 Mace is in his eighth year with Brakes having joined from Hinckley United in 2011, while Jamie Hood is in his second spell with the club having originally signed in 2010. Both remain among the first names on the team sheet and Holleran says their commitment to the club has been a major element in Leamington establishing themselves in the National League. “Mace looks after himself so well, he must be close to 400 games for us and you don’t get that now, especially at this level. “He’s shown great loyalty and we’ve four or five of them at Leamington. “It’s been the secret to our success. “There have been plenty of Step 3 clubs who have come up, bigger clubs with bigger budgets that haven’t done it. The blueprint has been continued with the more recent additions of Clarke and English and Holleran believes the blend of experience and emerging talent has helped players such as Danny Newton, Courtney Baker-Richardson and Matty Stenson progress their careers. “We’ve added Joe and Junior to the football team, all good characters. “They l0ve football, play it for the right reasons and it rubs off on the young lads. “They see good pros and they buy into it. They’ve got plenty of them around them and I think that is why young kids do well here. “They come into a good environment and Junior is a classic example, every week these players give everything. “No one can ever go away from a Leamington game questioning their application and how they approach the game. “And then you add in that element of quality. “We are lucky we have a fair share of good pros. “Take Courtney, he’d had six clubs in 12 months. “But the environment he came into here, where players do things properly, you fall into line. Brakes travel to Bradford Park Avenue on Saturday.